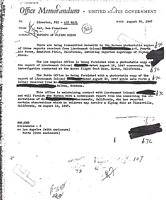 Memo to the Director, FBI (dated August 26, 1947) referring the sighting of "flying discs" by the Fourth Air Force, Hamilton Field, California. Click on Image for Larger View..
Over the last 5 decades there have been thousands of reported UFO sightings by pilots, both military and civil. The famous yachtsman Francis (later Sir Francis) Chichester actually began his career as a pioneering aviator. In 1931 he made the historic first solo flight from Australia to New Zealand across the Tasman Sea and during this flight he was suddenly startled by a group of flashing lights moving at high speed across the sky. One of the strange objects approached his aircraft - he described it as "like a silver pearl and flashing like a searchlight". The object moved in front of his aircraft before disappearing. The 2nd World War log book of Squadron Leader P.Wells records "a screaming dog fight with balls of light" (14th December 1943). Foo Fighters - photographed over Japan towards the end of the 2nd World War. Somewhere along the line they were given the nick-name "Foo Fighters" and were seen to emit a bright light or to flash intermittently. On 23rd November 1944, Lieutenant Ed Schlueter was piloting a mission in France when he, along with his crew, observed approximately nine balls of light travelling at high speed. These "Foo Fighters" were undetected by Radar and disappeared only to re-appear soon after before vanishing completely. Similar reports of these strange objects were made by many pilots throughout the rest of the war and it was speculated that the anomalous objects were a secret military device being developed by the enemy. However, the objects were seen by pilots of all forces involved in the war and suggestions that they were some form of Radar jamming device developed by the Germans seem unfounded as Foo Fighters were observed in the skies over Japan. 1947 was a notable year as far as UFOs were concerned being the year of The Roswell Incident and a number of significant UFO sightings. Probably the most important and certainly the most famous was the sighting of a group of UFOs by Kenneth Arnold, a pilot, whilst flying over the Cascade Mountains in Washington State (U.S.). Arnold, aged 32 and a businessman based in Boise Idaho, took off from Chehalis airport (Washington) at 2 p.m. on June 24th in his own small aircraft intending to search for a missing Marine C-46, in the hope of finding the craft and claiming the reward of $5,000. Flying conditions were very good and approximately an hour after take-off Arnold was at a height of about 9,500 feet in the skies near Mount Rainier when he was startled by an extremely bright flash. There was another aircraft in the vicinity but it was too far away to be responsible for the flash. Soon there was another and to Arnold's amazement he observed nine shiny objects in a chain-like formation, flying from the North to the South. The strange objects were flying between the mountain peaks and because of his familiarity of the area, Arnold was able to calculate their speed - in excess of 1600 m.p.h. which was well above the top speed of the fastest aircraft of the times. The anomalous objects had a strange appearance, having wings but no tails. Arnold watched the craft from a distance of approximately 22 miles and for about 3 minutes. Arnold, a highly responsible pilot, later reported his sightings and was interviewed by the press. During his first press interview he described the motion of flight of the objects "like a saucer would if you skipped it across water", hence coining the name "flying saucer". 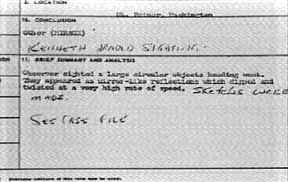 Kenneth Arnold's sighting caused excitement all over the world and was one of the main incidents causing the authorities to become interested in UFOs. 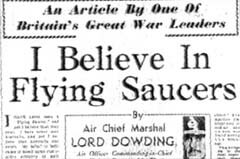 Many people believe that Kenneth Arnold saw "flying saucers". In fact they were not saucer-shaped. Kenneth Arnold described the objects in a radio interview shortly after his sighting. 1947 was a busy year as far as UFOs were concerned. On 24th June Kenneth Arnold saw a formation of nine objects over Mount Ranier (Washington State) which were later described as "flying saucers" by a reporter. This description was based on how Arnold described the manner in which the objects crossed the sky. This event heralded a host of sightings of mysterious objects capable of carrying out incredible maneuvers over a period of several weeks. A UFO photographed by a Canadian Air Force pilot. Pilots who risk reporting such objects risk being grounded or sent for psychological assessment. "The Meteor Jet was crossing from east to west when I noticed the white object in the sky. This object was silver and circular in shape, about 10,000ft up some five miles astern of the aircraft. It appeared to be travelling at a lower speed than the Meteor but was on the same course. I said 'What the hell's that?" and the chaps looked to where I was pointing. Somebody shouted that it might be the engine cowling of the Meteor falling out of the sky. Then we thought it might be a parachute. But as we watched the disc maintained a slow forward speed for a few seconds before starting to descend. While descending it was swinging in a pendulum fashion from left to right. As the Meteor Jet turned to start its landing run the object appeared hung in the air rotating as if on its own axis. Then it accelerated at an incredible speed to the west, turned south-east and then disappeared. It is difficult to estimate the objects speed. The incident happened within a matter of 15 to 20 seconds. During the few seconds that it rotated we could see it flashing in the sunshine. It appeared to be about the size of a Vampire jet aircraft at a similar height. We are all convinced that it was some solid object. We realised very quickly that it could not be a broken cowling or parachute. There was not the slightest possibility that the object we saw was a smoke ring or was caused by the vapour trail from the Meteor or from any jet aircraft. We have, of course, seen this, and we are all quite certain that what we saw was not caused by vapour or smoke. We are also quite certain that it was not a weather observation balloon. The speed at which it moved away discounts this altogether. It was not a small object which appeared bigger in the condition of light. Our combined opinion is that, it was something we had never seen before in a log experience of air observation." In October 1952, Captain Michael Swiney flew his third routine training flight from an RAF base in Gloucestershire with David Croft. They flew up through cloud to a height of 14,000 feet and Swiney was shocked to observe right in front of him, framed in the windscreen, three circular disk-shaped craft. Swiney turned to David Croft and asked if he had had a drink at lunchtime, to which Croft replied in the negative. Swiney told Croft to take a look right ahead! Croft too observed the three shiny disks. When Swiney returned to base he admitted that the experience had frightened him and was observed to be visibly shaken. A local radar station confirmed that the three “unknowns” had registered on the monitors. Retired Air Commodore Michael Swiney - saw 3 UFOs whilst on training flight. Retired Lt. Commander Croft - verified Michael Swiney's sighting of 3 UFOs. Croft's log book entry was far more careful than Swiney - representing the sighting with 3 disks! The entry in Michael Swiney's log book - an official record of his remarkable sighting.